Exciting rookie who took off with the creation of the UWA and cemented his status as a legendary name by being the first person to lose his mask to El Santo in the Palacio De Los Deportes. He followed it up by losing his hair to Santo less than a month later in the same building. Still had some name value in Mexico and ended up being asked over to New Japan Pro Wrestling for a feud with the original Tiger Mask whom he lost his mask to... except this time while wrestling as The Masked Hurricane. Word of this eventually found it's way back to Mexico and certain people weren't so thrilled. This effectively ended his working relationship with the UWA and he was mainly a local wrestler in Leon from that point forward. Also became the promotor of all shows at the Domo de la Feria in Leon, a position which he still holds to this day. Having that type of power has allowed him to participate in several angles such as saving his son from beatings and even putting his hair on the line both as a second and a wrestler in a match with two other referees. September 14,1973: Alvarado making debut in León, Guanajuato under the wrestling name of Impacto. 70's: Alvarado wrestling in Juarez as Gallo del Bajio, in that time with Flama Roja defeat Los Tigres del Ring in a mask vs mask tag team match in Juárez. As Gallo Tapado II was partner in tag team with Gallo Tapado. July 16, 1978: Bobby Lee defeat Solar to win the UWA world welter title (51 minutes match) on Monterrey. 24 consecutive defenses of the title, 14 in 1979. Bobby lost the title to El Signo. August 13, 1978: Bobby Lee & Villano III defeat Los Escorpiones in a mask vs mask relevos match in Palacio de los Deportes, Mexico City. Later Bobby began taunting and provoking El Santo almost immediately after the two agreed to wrestle. Bobby controlled most press conferences and interviews (like Muhammad Ali), Lee regularly taunted and baited his opponents —including Santo and Huracan Ramirez— before the match and often during the match itself. August 08, 1978: Bobby Lee El Santo in a UWA world title match on Palacio de los Deportes, Mexico City, the stipulation of the match was if Santo losing the title match he was accepting its mask vs mask challenge. Bobby turned the magazines and TV interviews into a circus, shouting and making fun of Santo. September 03, 1978: El Santo defeat Bobby Lee (in a questionable way, Lee had his foot on the ropes when Santo made him submit to "la de acaballo" (the camel clutch), but the referee didn't see it.) in a mask vs mask match on Palacio de los Deportes, Mexico City. September 24, 1978: El Santo defeat Bobby Lee (in a questionable way again, this time Bobby defeated Santo, but your error was that did not break the submit move to El Santo and caused the referee will disqualify) in a mask vs hair rematch on Palacio de los Deportes, Mexico City. After the mask vs hair match, there was more matches between Santo and Bobby in several cities on Mexico. December 10, 1978: El Santo, Huracán Ramírez & Dory Dixon defeated Bobby Lee, Villano III & César Valentino on El Toreo de Cuatro Caminos in Naucalpan, México. November 18, 1979; El Santo, Aníbal & Bobby Lee vs Tony Salazar, Villano III & Rey Neptuno ended without a winner on Naucalpan, México. Bobby Lee, which was to wrestle to Guatemala, Bolivia, Panama, United States and Japan, in this country where it had more recognition and inclusive they wanted that it was remaining like trainer, but its injury prevented him from teaching in Asian grounds and caused the retirement. October 10, 1981: Tiger Mask defeat Masked Hurricane (Bobby Lee) in a mask vs mask match on Sumo Hall Tokio, Japón. September 12, 1982: Bobby was the ref in Santo's last match on El Toreo de cuatro caminos. March 27, 1983: Bobby Lee defeat Tony Santana in hair vs hair on Arena López Mateos. 80's: His retirement was by a back injury, a urban legend says Villano I defeated Bobby Lee in a local gym where the 'beast of 78' challenge it, Lee was hurt of gravity after the shoot match (close doors without fans) and it is said that this injury caused his retirement. May 19, 2002: Bobby Lee came out of retirement and defeat El Tirantes in a hair vs hair triangular match w/ Copetes Salazar on Domo de la Feria - León, Guanajuato. When the WWE visited León, Guanajuato the Superstars of the WWE was being photographed with Bobby Lee, wrestlers stars as Santino Marella, MVP, The Miz, Big Show and Triple H who scolded John Cena because it he did not know the big reputation of Bobby Lee. Bobby Lee speaks with the UWA/LLI promoter Francisco Flores and asks for an opportunity to against the top stars or if it was not moving back since he wanted to be closer to its family, Mr. Flores offers him to match against El Santo but on the condition that it was doing a spectacular campaign, Lee accepts. 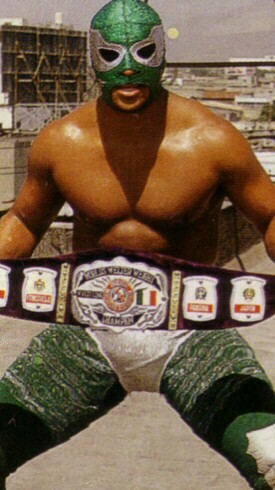 Bobby Lee defeated Solar (51 minutes) to win the UWA World Welterweight Title on Monterrey, Nuevo León. Lee returns to Mexico City and Francisco Flores recalls his promise that if he could major triumphs scheduled the match against El Santo. The reporters ask Santo about Bobby Lee and his challenge of mask vs mask and Santo responds: "Bobby who?" The publications specialized made use of this answer and the headings of the wrestling magazines published: who is Bobby Lee? Bobby responded to the media: "I'm Bobby Lee and I who goes to withdraw Santo". To be able to wrestle El Santo, first Bobby Lee had to win to the Escorpiones challenge in a masks vs mask match with Villano III. Later the wrestling magazines and papers started calling "La Bestia del 78" (The Beast of '78). Bobby Lee and Villano III defeated Escorpión I & Escorpión II in a masks vs masks match on El Palacio de los Deportes. Later Bobby began taunting and provoking the biggest star of Lucha Libre; El Santo but did not want to wrestle with Bobby because he thought he was very young and it was also a rookie. Lee verbally abused Santo in the interviews. Lee turned the magazines and TV interviews into a circus, shouting and making fun of Santo. nicknamed Santo "The silver mummy". Later Bobby Lee said that Santo wouldn't leave the business masked and challenged him to a mask vs. mask match and also said "Santo was too old", El Santo almost immediately after the two agreed to wrestle but first wanted a title shot. Santo said to Bobby: "first of all I would like the opportunity for the title, if I won there will be no mask vs mask match, if the retained its belt then if we are going to face by the masks". In a TV interview Bobby said to Santo: "Santo says that he is going to retire, no way, i am going to withdraw it: what does not he feel embarrassed to fight at its age?, you can't see you fight with someone who has 30 years of age unless you?" Bobby Lee defeated El Santo with a Gory Special in a UWA world title match on Palacio de los Deportes, Mexico City, the stipulation of the match was if Santo losing the title match he was accepting its mask vs mask challenge. At the request of Santo the presenter announced that Santo accepted the mask vs mask match. Wrestling magazines calling that match between the Professor (Santo, a top star, the big legend) vs the student (Bobby Lee, the rookie, the world champion). El Santo defeat Bobby Lee in a rematch mask vs hair on Palacio de los Deportes, Mexico City, in this match Bobby Lee scratched the glory for a few moments but fate did not want that Santo was losing the match. Santo won in a questionable way again, this time Bobby defeated Santo, fans began to cry the defeat of Santo, the people were quiet but the referee disqualifies Bobby by excess of punishment and take over Santo (Lee's error was that did not break the submit move to El Santo and caused the referee will disqualify), and several seconds after confusion reigned and this was not clarified until that fans saw that Bobby Lee cutting her hair with a scissors. After this match, there was more matches between Santo and Bobby in several cities on Mexico. Bobby Lee in a interview says: "Gave me a great sadness and shame having lost my mask to El Santo and how the lost? I lost because the referee gave the win to Santo and I having my foot's out of the rope and that was not legal"
Bobby Lee, speaking about Santo mask vs mask's match on a shoot interview with El Hijo del Santo TV show (Experiencias con el Hijo del Santo ):"I know that I you could win....humiliate it, crush it in your honor, did not respect it"
"I have had contact with people in the WWE and they themselves are surprised to learn who i was, Big Show, CM Punk, Triple H, Randy Orton, Mr. John Cena said: why are taking pictures with it? But Triple H said to him: shut up, you still weren't training when this men was world champion, John Cena asked "who is it?" He said Triple H: He is Bobby Lee, have match against Tiger Mask in Japan and working with Antonio Inoki". "THERE WILL BE NO HUMAN POWER THAT PREVENTS MY PLANS; mask vs mask against the SILVER MUMMY, that is why I accepted expose my world title with the, because if i had to defeat, as it will be no-one can doubt MY RIGHT AND MY PRIORITY, now if any opportunist tries to challenge me also I will finish it, and one thing I can tell you now: yourselves all the MUMMIES and i refer to BLUE DEMON, HURACAN RAMIREZ because they will be my next victims". "To become someone in pro wrestling it had to shoot the top stars and my idea was to unmask El Santo". "I am going to finish with the legend of Santo!" "Send me to the silver mummy!" "Santo says that he is going to retire, no way, i am going to withdraw it: what does not he feel embarrassed to fight at its age?, you can't see you fight with someone who has 30 years of age unless you?" "I lost because the referee gave the win to Santo and I having my foot's out of the rope and that was not legal"
"I know that I you could win....humiliate it, crush it in your honor, did not respect it"
"I am BOBBY LEE the only one, there was no other!" "Satoru Sayama see me wrestling in Mexico, he wrestled in England under the Bobby Lee' same mask and name, for that the wrestling magazines were published: Mr. Sayama, you know Bobby Lee there is only one, and this in Mexico". "I was one of her first Hijo del Santo trainers, please tell them who was his first trainer?" with son, Bobby Lee Jr.
"I am BOBBY LEE the only one, there was no other"